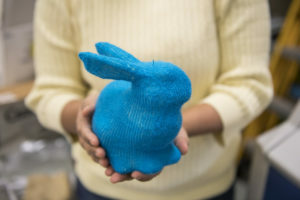 Knitting machine rabbit produced by Jim McCann, an assistant professor, and students at Carnegie Mellon University School of Computer Science on March 16, 2018. According to legend, knitting originated in Egypt in the 11th century, spread to Europe in the 13th century and to the Americas during early European colonization. Machine knitting began in the 16th century, but didn’t fully take off until the latter part of the 19th century. Now computer scientists say they have developed a way of translating 3D shapes into instructions allowing a computer-controlled knitting machine to automatically produce them in yarn. A press release from Carnegie Mellon University in Pittsburgh issued this week states that researchers in the Carnegie Mellon Textiles Lab have already used the system to produce a variety of plush toys and garments. The stated aims of lab leader James McCann, an assistant professor in the university’s Robotics Institute, is to simplify knitting, making it possible to produce customized hats, gloves or other items one at a time or in small numbers. He intends to make “on demand” knitting instructions easily available, eliminating the need for human expertise. He also developed a crowdsourcing sock knitting platform called Knitout, which allows anyone to design socks, develop a sales strategy and have them produced by a machine based on sales demand. The new 3D system produces smooth knitted cloth, the press release said. From the perspective of a knitter, eliminating the need to actually knit may offer benefits for making large scale projects. This entry was posted in ruminations and tagged craft, easter, knitting, machines on 30/03/2018 by Julie Mollins.